The National Science Foundation recently awarded funding to IRIS and UNAVCO for a unique proposal to design and build a reliable power and communication system for autonomous polar station operation. This development effort will involve close collaboration with Antarctic seismologists and GPS scientists. The stated goals of this project are to use the latest power and communication technologies, linked with the collective experience and expertise of the science community and IRIS/UNAVCO staff to 1) design, integrate, and test a scalable power and communication system optimized for ease of deployment and reliable multi-year operation in severe polar environments; and 2) provide an initial pool of these systems for deployment and testing in science experiments. 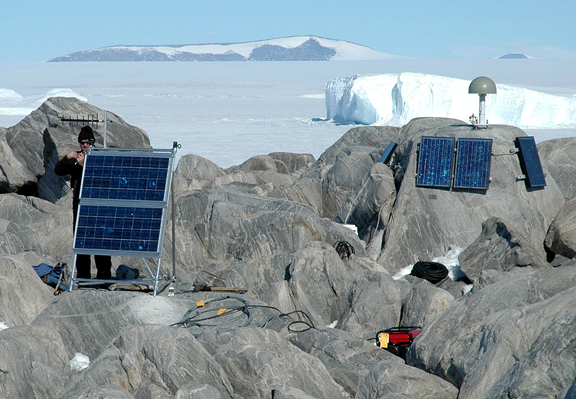 Continuous, year-round seismic and geodetic measurements at remote sites will meet longstanding polar and global geoscience goals that have previously been unattainable. 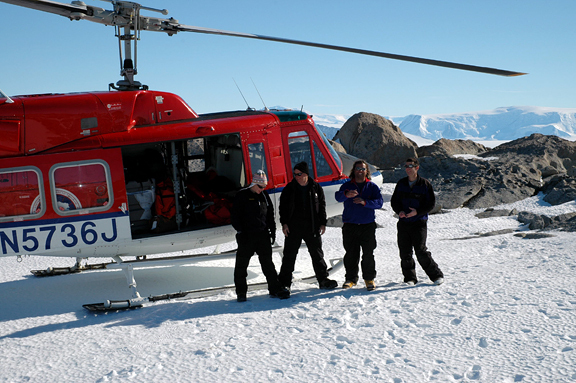 Access to the new systems through UNAVCO and IRIS will open doors for scientists and institutions that do not have the technical and field skills currently required to execute remote polar GPS and seismic research projects. UNAVCO field engineer Seth White works on power and communication upgrade to Cape Roberts continuous GPS site. The proposal also includes the first Education and Outreach initiative on behalf of UNAVCO for the polar community. Funding for an upper-level undergraduate student to participate in UNAVCO's Research Experience in Solid Earth Science for Students (RESESS) program will be provided by the grant. Field crew after installation of Fishtail Point continuous GPS site that is downloaded via Iridium: Stephanie Konfal (OSU), Michael Starbuck (USGS), Mike Willis (OSU), Bjorn Johns (UNAVCO). The principal investigators on this proposal are David Simpson and Kent Anderson of IRIS, and Will Prescott and Bjorn Johns of UNAVCO. Bjorn Johns was responsible for coordinating the proposal effort which would not have materialized without considerable contribution from the polar GPS and seismological scientists, led by Terry Wilson of Ohio State University, Andy Nyblade of Pennsylvania State University, and Doug Wiens of Washington University in Saint Louis.